InfraCrete® is a mineral additive for cement. It transforms existing soil into highly durable, long-lived base and anti-freeze courses. Base courses created with InfraCrete® are resistant to frost, salt and acid. They can be constructed with or without an additional wearing course (asphalt, chipseal, and cobblestone). They are suitable for road and industrial construction and ready for use after a hardening time of only 12 hours. InfraCrete® accelerates the process of cement hydration. It counteracts the organic humic acids of the soil and prevents damaging sulfate attack and the alkali-silica reaction (“concrete cancer”). By initiating structural transformations and the new formation of minerals, it has a positive effect on the compressive strength, tensile bending strength, modulus of elasticity and freeze-thaw of the material durability while decreasing the permeability of the base course. Regular construction methods require the excavation, transport and disposal of the existing soil material and the subsequent filling of the excavation pit with additionally supplied filler materials. With InfraCrete®, you need none of the above. Instead, InfraCrete® allows you to utilise the ground material that is already in place or use the existing, old base and wearing courses. It efficiently transforms these materials into a durable, highly resistant base and anti-freeze courses. Base and anti-freeze courses created with InfraCrete® are more stable than those produced by standard processes. At the same time, the InfraCrete® technology for soil stabilisation and HBL constitutes a nationally and internationally widespread procedure that complies with generally accepted rules of construction technology. Of course, base and anti-freeze courses built with InfraCrete® comply with all requirements for use in water conservation areas. The addition of InfraCrete® accelerates the hydration process. Not only does this increase the early strength of the newly constructed base course, it also lowers the hardening time considerably: the base course can be used after only 12 hours. InfraCrete® also considerably increases the strength of the material during the 28-day hydration process. The product achieves a 70% increase in the tensile bending strength during the early hydration phase, which distinctly reduces the risk of shrinkage cracks. As a direct result, the water absorption of the base courses decreases and they become significantly more resistant to frost and thawing. What are the advantages of InfraCrete®? Lower construction costs, shorter waiting times, less maintenance. InfraCrete® allows you to build and restore base courses in a modern, sustainable way. With InfraCrete®, you can produce high-quality base courses with a long service life and low maintenance requirements without breaking your budget. The use of InfraCrete® facilitates the resource-friendly utilisation of existing soil. It completely eliminates the need to excavate, transport and dispose of the soil material. There is no excavation pit that needs to be filled with additionally supplied filler materials. By eliminating many tasks that are necessary for conventional processes, InfraCrete® allows you to construct base and anti-freeze courses in a much shorter time. You can use the base courses created with this method after only 12 hours, e.g. by adding a wearing course or opening them for traffic directly. Base courses built with InfraCrete® are especially resistant to (frost) damage. This reduces your need to carry out maintenance and repair works to an absolute minimum. By using InfraCrete® to build your base courses, you reduce their total cost of ownership throughout their entire calculated lifespan. Where can I use InfraCrete®? As a universal binder system, InfraCrete® is a cost-efficient and sustainable solution for many construction tasks involving the construction of highly durable base and anti-freeze courses. For what projects can I use InfraCrete®? InfraCrete® benefits all projects that require a durable foundation. This includes road construction, industrial, commercial, logistical and real estate projects. The product is equally well-suited for new constructions and restoration projects. Even temporary construction measures (construction site access roads, heavy-duty surfaces, surfaces for mobile cranes, etc.) can be built extremely cost-efficiently, as InfraCrete® base courses are fully recyclable. With what soil types can I use InfraCrete®? All coarse-grained, mixed-grained and fine-grained soil types, including organogenic soils, can be transformed into highly stable base and anti-freeze courses with InfraCrete®. The only type of soil unsuitable for base courses is organic peat. For restoration projects, you can reuse all materials in the existing base and wearing courses (including asphalt and cobblestone) to save resources. Road restoration: economical, fast, durable! 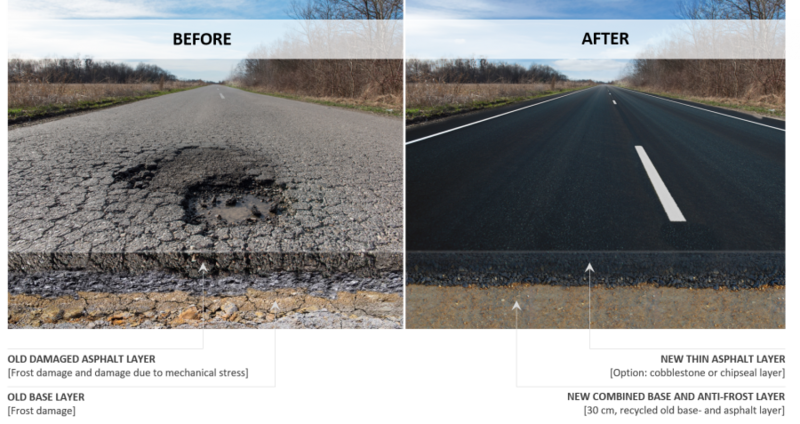 With InfraCrete®, you can save resources, time and money for your road restoration projects. Simply reuse almost all of the existing road material. Mill and homogenise the old road surface and the upper wearing course. Now, combine the road material with InfraCrete® and Portland cement. This process also permanently immobilises contaminants, such as PAH and heavy metals, in the subsoil – so you do not have to spend large sums on their disposal. How much can I save with InfraCrete®? Calculate the savings potential for your personal project. Construction of a quality base course incl. preparation work, engineering services and finishing, excl. wearing course, average prices for Germany, no liability assumed. 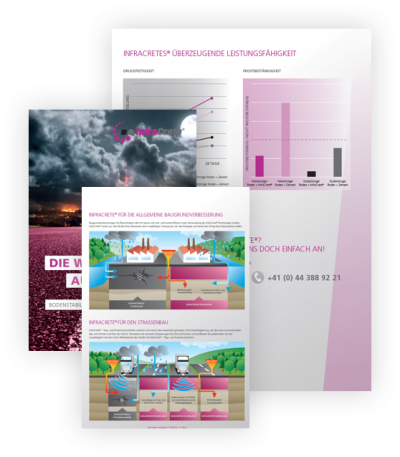 InfraCrete® has been in use in nearly all geological and climate conditions all over the world for a long time. Small, owner-managed construction and engineering companies rely on the InfraCrete® technology just as much as renowned corporations and public bodies. We have put together interesting information about our product, its benefits, its use and how to buy it. Download our latest product brochure containing a compact overview of all useful information. Would you rather have detailed, technical information about our product? Are you interested in our project references? Would you like to discuss your own construction project with us during a non-binding consultation? Just complete our contact form and we will get in touch with you. InfraCrete GmbH is a legally and financially independent owner-managed company. We stand for excellent quality and technological leadership “made in Germany”. Our customers, partners and employees appreciate our consistent work with them. We conduct our daily business by the principles of sustainability, partnership, fairness and transparency. Our sales team looks forward to hearing from you. To find out about distributors in your region, please get in touch. You can also call us on +41 (0)44 388 92 21. Our hotline is available from 09:00 CET to 17:00 CET on every working day. Yes, please put me on your mailing list.